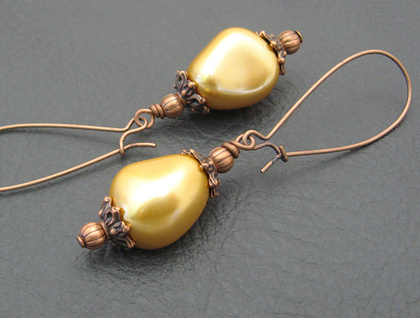 Fat, buttery, golden glass pearls are the stars of these earrings. They are framed by antiqued-copper coloured bead caps and tiny, pumpkin shaped, antiqued-copper coloured beads. The whole opulent ensemble is wire-wrapped on a single headpin, and suspended from antiqued-copper coloured ear-wires. 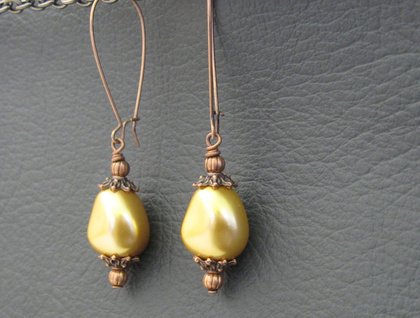 The yellow-gold imitation pearls are irregular in shape, like freshwater pearls. They have a glossy, smooth, gleaming surface and rounded shape that is reminiscent of soft, almost melting, butter. 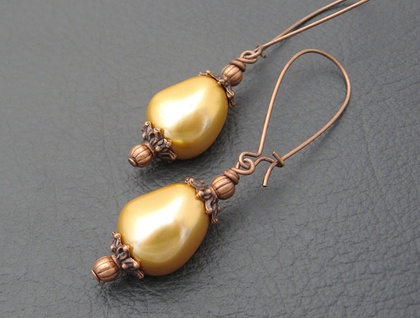 Paired with the antiqued copper, they make a warm, luxurious combination. The 'Golden Silk' earrings measure 64mm from top to bottom. The dangles from the bottom of the ear-wires measure 32mm. The faux pearls are 13mm across at their widest point. 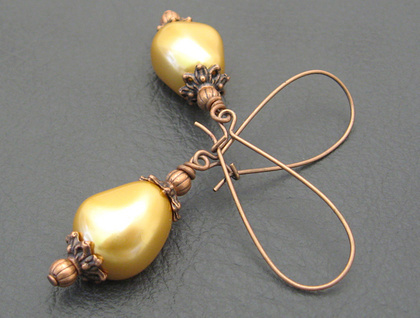 The ear wires are copper based and nickel free, so most sensitive ears should be fine wearing these.